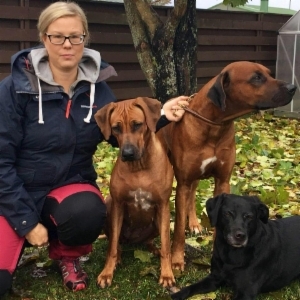 My name is Hanna Vesterinen and together with my family and two ridgeback Goshi and Tara and labrador Elle we live in small town called Varkaus in Easter-Finland. In my child hood home my father had sled dogs and early on my age I usually helped him. Our first together dog was mixed breed Jeppe. Jeppe move to our life on 1999 and with Jeppe I get to know on dogs world and dogtraining. We did with him basic obedience and went to agility course. We got our first ridgeback on 2004 from kennel Sangoma, Poland and after the we been stayed on this road. This bread has totally got our hearts. With Nemo I start to obedience and agility training. We also did search and tracking with him. I did competing couple times but it wasn't our cup of tea. With Nemo I also enter the dogshow world and we got couple champion titles with him. After my first ridgeback I noticed soon to help other to training their dogs and I have been doing that ever since. I try to teach other dogowners how to be active and have fun with their dogs in different course like puppy, handling, obedience and agility. Our second ridgeback come from kennel Tarujen, Finland big little fellow who changed our lives. I start to competing in obedience and we got the title OB1, bloodtrackking and agility. I got more dogs shows all over the world and I could say that we travelled together thousands of kilometers. He left the big pawprint everywhere he go and biggest of all in our hearts. After two ridgeback our lives moved to little black princess labradorretriever Elle on 2011. Elle come to us from my friend older age. Mira was planning WT and Working dog trials to Elle. Elle get heats up when you training with her the bird and some times she start to bite the bird. So Mira diceded to sell Elle to me and with Elle I have been able to competed obedience and agility in highest class and just before my daughter born we manage to got FIOCH ( Finnis obedience champion title). Elle competing also in bloodtrackking on champion class. She is very activity and strongmind female and was just perfect to our pack with ridgebacks. Our third ridgeback came form Russia kennel Faira. I was looking many years for new family member and soon I saw pictures of little Goshi I totally fell in love. Goshi is very lively and activity male. We have competing in rallyobedience and agility. Our fourth ridgeback also came from Russia, kennel Ele Tori. I was looking over the years many dogs behind Tara's bedigree and I like them alot. Some of them I have met in dogs shows. So Tara move to Finland in 2017 at the age of 5 months. I hope that some day she is part of our breeding plans but time will tell how it goes. Our kennel name "Milele Uwayo's" is Swahili and means everlasting pawpring and come to after my second ridgeback Tarujen Uwayo. Our goal isn't breed very frequently. We hope to give the puppies the best start what we could offer to them. We put a lot of time and effort in socializing the puppies. They will be raised in our home surrounded by all daily noises and they will get some extra love and care from our kid. Our main goal is to breed healthy, happy and beautiful Ridgebacks with nice character. If you want to get in touch with me you can send me email at hannavesterinen1@gmail.com, or at call +35840-735-92 92. We are member of Rhodesian Ridgeback club in Finland and Finnish kennel club.